We had taken the overnight flight on the Tuesday and landed in Sao Paulo on Wednesday morning. Traffic is Brazil is always bad and after a two-hour journey we arrived at our hotel. We checked in and grabbed some breakfast before a quick shower and change and it was out to film a guide to the city. After starting at the cathedral in the very heart of the city, our next stop was Batman Alley, or Beco de Batman. It's an alleyway that you probably wouldn't ordinarily venture down but in the 1980s, an artist painted Batman on one of the walls and since then local student artists have all added their own work. It's definitely worth a visit as there is some real talent on display and it covers every inch of plaster. Even the tiny pavement bollards have been painted as dice! We then went to Ayrton Senna Park. It's a really peaceful corner of the city dedicated to Senna. A bronze monument of him was moved there last year from its original position over a bypass. In front is a bronze helmet and behind, a huge Brazilian flag. It's a beautiful spot In a concrete jungle and is now protected by security to make sure it stays that way. The other spot that is a must for F1 fans is his grave in Morumbi cemetery. It seems it always has fresh flowers on it and there is a steady stream of fans paying their respects. Lunch was at the famous Fogo De Chao. It's a Churrascaria, a Brazilian barbecue. You can't go to Brazil and not go to one. They are all over the world now too so chances are you have one near you. Once you have gone up to the salad bar to get your greens you sit at your table and are sure the card by your place setting has the green side of it face up. Then the waiters know to bring you some meat. They also give you a card to show you which parts of the cow they are serving. Once you have had enough, or just need a breather, you turn your card to red and they stop bringing it. Pretty much every night of the race weekend the restaurant has at least one or two Formula 1 teams in there having a big group dinner. We finished at the City's Skye bar, which has an incredible view of the city, with a Caipirinha cocktail. It's made with cachaça, which is Brazil's most common distilled alcoholic drink, two teaspoons of brown sugar and half a lime. Let's just say it's an acquired taste! On Saturday I was in the pen for qualifying for the first time this season and managed to speak to all the drivers except the top three before I had to leave for the F1 Show and Ted replaced me. That meant he got to quiz Seb on his weighing scales incident. It is a contentious issue, whether or not drivers should have to go to the weighbridge in the middle of a qualifying session. Ordinarily its a necessary nuisance for drivers, but with the weather changing as it was on Saturday, it became a big issue for Seb. It's been shown now that he did turn the engine off but when he left the scales he did so by revving the car instead of waiting to be rolled off, as is the usual procedure, and the rear scales shot backwards and were damaged. He was fined and reprimanded for the incident but kept his front-row start. Vettel has said that the officials shouldn't call drivers in when the conditions are changing like that, but even so there are rules and procedures that need to be followed for everyone's safety. On Sunday I walked to the track parade with Marcus Ericsson as he had had his best qualifying of his career. Along with Brendan and Stoffel, it seems those not on the grid next year have found an extra gear, the 'what ifs' going around their heads must be infuriating. I was by the truck for the drivers parade a short while later and all the drivers gathered in the FIA garage ready to board. The grid kids were there too and all lined up for a photo for the FIA's road safety campaign. Then the drivers were sent out to the truck. All but one left the garage. To those outside it looked like Lewis Hamilton was making all the other drivers wait for him to arrive, but those of us at the scene saw the grid kids surround Lewis and all ask for photos and autographs blocking his way. He stayed to sign them all before leaving for the truck. The toilet run interviews in Brazil are always busy because of the way the grid is. There is really only one way to get back to the pit lane unless the driver wants to walk up the length of the pit entry. I spotted Max heading into his garage so waited for him to come back out. I asked him if he had the car to win today and he said "Not to win, we have to go past four cars" and he added he would try to go for a podium. I asked why he thought that considering the Red Bulls good pace on the longer runs on Friday and he acknowledged that they had that good race pace but that "passing here especially when we are so much down on top speed around here is going to be difficult"
We all know how the race panned out and I was waiting in the pen to speak to the drivers. Esteban came in first and at that point none of us knew about the pushing and shoving in the FIA garage. The first I knew was when Esteban mentioned it in his answer. By the time Max came into the pen we had all seen the footage and so I had to ask him about it. There is always a fine line between asking the questions that need to be asked but appreciating the emotions of the moment. 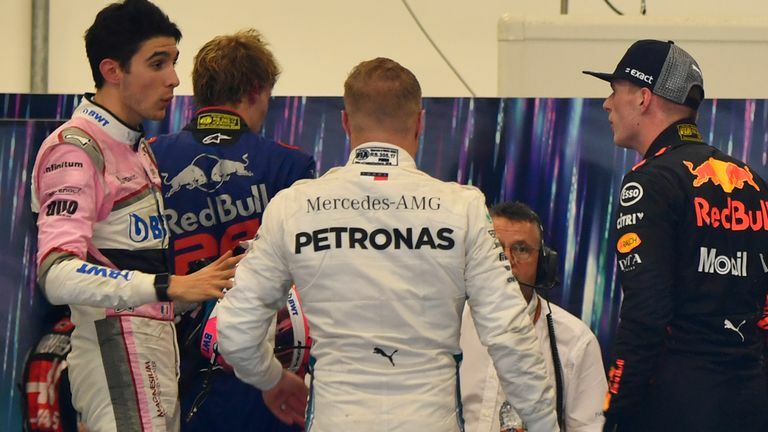 A furious Max Verstappen remonstrates with Esteban Ocon following their clash during the Brazilian GP which saw Verstappen lose the lead. Both drivers were called to the stewards and I was tasked with waiting for the outcome with my cameraman Lee in the paddock for as long as we could without missing our flight. Finally the two drivers emerged and as they walked towards me Max reached out a hand and Esteban shook it before they then both parted ways. It would be a while later, as we raced to the airport for our flight that we would hear the outcome from the stewards. Some say the punishment for Max wasn't severe enough and if you take into account his status as a role model to young karters you could argue that point. But for a driver who, if his answer to me was genuine, didn't believe he could win that race, to find himself losing victory in the way he did, I think Max's lesson was learnt on track. You only had to hear Lewis in the cool down room telling Max he had more to lose than Ocon at that moment to realise that with experience comes wisdom. Lewis has admitted he gives Max a bit more room than most. No one wants Max to stop racing, to stop creating wins out of seemingly nowhere, but as Hamilton said when I asked him what he would do, "You know what I would do, I've won races, you make sure there's space. You always make sure there's space." When's the Abu Dhabi GP on Sky? A few hours later, there was another awkward moment for Max as he arrived at the airport to see a long queue to check-in for the flight. He took his place at the back... right behind the Force India team who had arrived moments before.